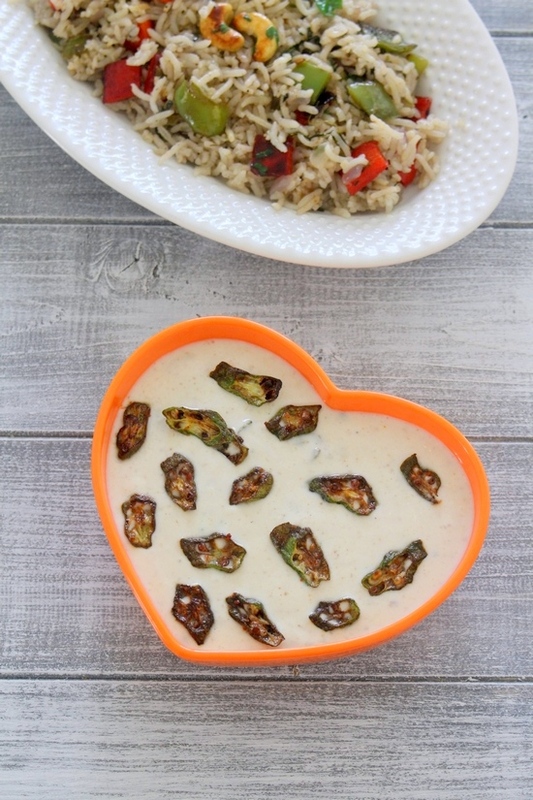 Bhindi raita recipe (Okra raita) – this is different than usual raita recipes. Here crispy okra are mixed with spiced, chilled yogurt. He is not the only one, many will think the same. As a human being, only common, usual or popular things will come to our mind first. This okra raita is a nice variation and change to our usual raitas. I never tried bhindi raita before. I have only read the recipes into the books, but never got chance to make it. The most I like about this bhindi raita is the texture of it. Crispy, fried bhindi in chilled, refreshing yogurt!! I really loved it. Few days back I made achaari bhindi sabzi (will post the recipe soon), after making that I had few bhindi left so thought of making this bhindi raita. To go with it, I have made capsicum pulao. For many capsicum and bhindi is little weird combination. But trust me, this combination tastes really good. Have you tried my bhindi capsicum sabzi? If Yes, then you know it is good combo. 1) First wash the bhindi and wipe it clean, dry using kitchen towel or paper towel. Now cut and discard the head and tail part of bhindi. Then slice them diagonally into thin slices. As the knife gets sticky, wipe it clean using paper towel. Keep slicing and wiping the knife as it gets sticky. 2) Heat 1 tablespoon of oil in a wide pan on medium heat. Add okra and spread them into single layer. Do not overcrowd the pan. If needed fry them in 2 batches like I have done. 3) As it gets cooked, it will get darker in color and they will shrink. Keep moving and flipping them during the cooking to get even browning. 4) Fry them till they are browned and crispy. Do not burn them. 5) Remove it to a plate and fry the next batch. 6) While the fried bhindi is still warm, sprinkle the red chili powder on it. Once the second batch is out from the pan, sprinkle chili powder in that too. Let the okra cool completely. 7) Take yogurt in a bowl. 8) Using whisk or spoon, beat it till it is smooth. 9) Add salt, black salt, black pepper powder and roasted cumin powder. 10) Mix well so spices are well combined with yogurt. If you are not using chilled yogurt then keep this yogurt mixture into the fridge to chill. 11) Now at the time of serving, add fried, crispy okra and chopped coriander leaves. raita is ready to serve. I had kept few crispy okra for garnishing for the photo purpose. Raita tastes best when served chilled, so always use chilled yogurt right from the fridge. It should be served immediately. If you make ahead of time and store in the fridge, crispy bhindi will become soggy. If you want to make ahead of time, make spiced yogurt, cover the bowl and keep in the refrigerator. Fry the bhindi, let it cool completely and keep that at room temperature. At the time of serving, mix them and serve right away. Serving suggestion: This bhindi raita can be served with any rice dish like veg pulav, tawa pulao. This okra raita can be served as an accompaniment with your meal. 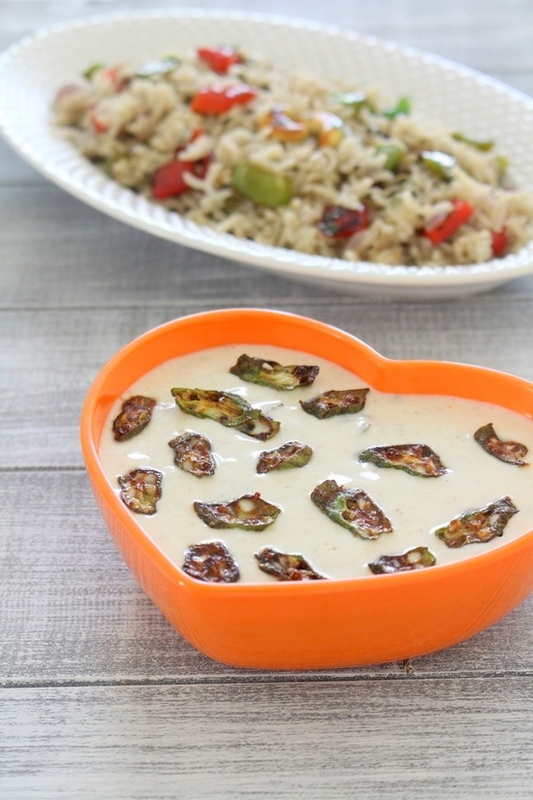 This bhindi raita is little unusual than regular raita recipes. But trust me this okra raita tastes too good with pulao. The crispy okra in chilled, lightly spiced yogurt is the good combination. First wash the bhindi and wipe it clean, dry using kitchen towel or paper towel. Now cut and discard the head and tail part of bhindi. Then slice them diagonally into thin slices. As the knife gets sticky, wipe it clean using paper towel. Keep slicing and wiping the knife as it gets sticky. Heat 1 tablespoon of oil in a wide pan on medium heat. Add okra and spread them into single layer. Do not overcrowd the pan. If needed fry them in 2 batches. As it gets cooked, it will get darker in color and they will shrink. Keep moving and flipping them during the cooking to get even browning. Fry them till they are browned and crispy. Remove it to a plate and fry the next batch. While the fried bhindi is still warm, sprinkle the red chili powder on it. Once the second batch is out from the pan, sprinkle chili powder in that too. Let the okra cool completely. Take yogurt in a bowl. Using whisk or spoon, beat it till it is smooth. Add salt, black salt, black pepper powder and roasted cumin powder. Mix well so spices are well combined with yogurt. If you are not using chilled yogurt then keep this yogurt mixture into the fridge to chill. Now at the time of serving, add fried, crispy okra and chopped coriander leaves. Stir well.